Teaching is a tradition in Sarah Hadtrath's family, dating back to her great-grandmother being a teacher in a one-room schoolhouse. Both her grandpa and grandma on her mother's side are teachers, as are her mother and aunt. Sarah Hadtrath, a recent SCSU graduate, has joined the teaching staff at PAES this January. She will teach EBD students in grades K-5. It's her aunt, though, that led Hadtrath into special education. When Hadtrath started school at St. Cloud State University, she knew she wanted to be a teacher and started in elementary education, but her aunt got her interested in working with emotional and behavioral disorders (EBD). 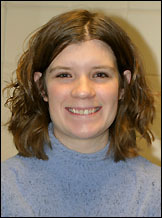 Hadtrath started as a new EBD teacher at Paynesville Area Elementary School on Monday, Jan. 3. She replaces Leza Weber, who moved out of state with her family. Hadtrath, who graduated from SCSU in December, is licensed to teach EBD students in grades K-12. She will be working with EBD students in grades K-5 at PAES. "I like the more individualized instruction in special education and the smaller class sizes," said Hadtrath. Before Christmas, Hadtrath spent a couple days in the classroom with Weber, meeting her dozen students. Building relationships with these students will be her first task, said Hadtrath. Meeting them before the holiday break helped and kept them from wondering who their new teacher would be throughout the holiday, she added. Hadtrath, a 2001 graduate of Cambridge-Isanti High School, was pleased to find a job opening in a smaller town, especially so close to St. Cloud. She is excited to start teaching, she said, after training for four years. So far, the staff at PAES has been very nice and supportive, she added. Hadtrath, a newlywed, is buying a house with her husband in Cold Spring. In her free time, she likes to hike, camp, travel, and spend time with her friends, family, and dog. Other new teachers this year in the Paynesville Area Public Schools are speech clinician Michelle Hesse-Cremers, special education teacher Ted Nett, school nurse Leah Neu, ag teacher Natalie Todnem, and art teacher Kelli Woehler.